At our 4th meeting of the Feminifesto Seminar Club, we discussed the comic book, Ms Marvel #31, published in June 2018. Featuring Kamala Khan, Marvel’s first Muslim character to headline her own comic book, the story revolves around her struggles to juggle her normal teenage life and her superheroine life. The 50th edition special, Ms Marvel #31 has contributions by guest writers and illustrators including the likes of Hasan Minhaj and Rainbow Rowell. Right off the bat, the four of us agreed that it was a great feeling to see a brown girl being represented by such a popular comic book company. Vaishnavi told the group how Kamala Khan is so relatable in terms of how, for instance, she has to navigate coming from a traditional family wherein she has to convince her parents for a sleepover with her friends. Everyone agreed saying it is probably something every young brown girl has to go through. We acknowledged how it must be difficult to juggle so many things and keep up with the times, especially when living amidst the diaspora in the United States where things like sleepovers are normal. Vaishnavi posed a question that stayed with her throughout the reading of the comic, noting that women in superhero comics are more often than not, scantily clothed and depicted with large cleavage and uncomfortable costumes. She asked the group if they think that stereotype is sexist or if it could be empowering. Malavika remarked the double-edged sword of the thought: while these comics started out with the target audience of young men and hence catered to their so-called interests, she felt as though it was something women could also claim and embrace for themselves. She also noted the differences in cultural background and upbringing of different superheroines. While she would take issue with Kamala Khan being depicted wearing little clothing, it would be more understandable seeing Wonder Woman in that way, for example, who comes from a vastly different universe. Vaishnavi added that comic books have mostly been written with heavy observations from the male gaze. Harini added to the discussion and made a very interesting point, observing that for male characters, their attire is given less importance and their capabilities and powers are prioritized more. On the flip side, for female characters, their costumes are probably more significant. She also commented that often femininity is not associated with heroism. She debunked the stereotype with an apt example, citing how Wonder Woman is seen as an exemplary feminine character who is yet very powerful and one of the most popular superheroes. Raakhee noted how having women writers pitching to the story enables the characters to make choices true to themselves, while reflecting their personalities. Raakhee and Harini told the group they loved the solidarity shared among the women. Harini noted how Kamala’s friends always supported her regardless of the circumstances and Raakhee quipped how Kamala is a better heroine and woman because of the unconditional support she received from the women around her. When the discussion turned to the question of why there are so few female superheroes known by the general public, Vaishnavi thought it was largely because comic books are hard to access outside the United States and because the characters did not reach the mainstream international audience until the launch of the Marvel Cinematic Universe. Harini made a valid and pertinent point, remarking that most of the famous characters we know now were created decades ago and were reflective of those times in the US. She mentioned how it would take time for a newly created character to gain popularity. 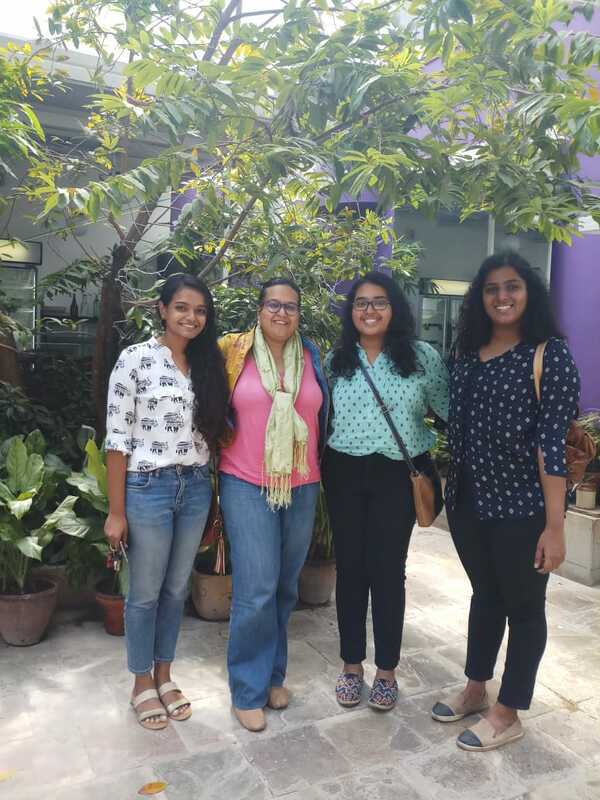 On that note, Vaishnavi asked the group: “are women genuinely not interested in the comic genre because of the many stereotypes dictating it’s a boys club?” Malavika responded saying that women are scarce in the comic book industry due to a lack of opportunities. Harini noted how the status quo is changing and how more women are becoming more interested in the comic book genre and how the target audience for the same, is changing for good. Raakhee added how the promotion of comic book films is often not targeted for women but rather focused on what audiences want to see in the movie (action sequences and witty remarks, for example). Malavika interestingly told us that, nowadays, marketing executives capitalize on having a strong female lead or having a woman in the writing team, in order to the attention of women by promoting diversity (even if it is token representation) and is thus indicative of the times we live in, wherein representation is demanded to be a norm rather than an exception. We all agreed that the impact was more profound and valuable than the intent, because this way women will be represented more in the genre. The last question Vaishnavi had to ask the group was: what does a feminist superhero look like? She explained that she thought feminism and violence were incompatible. Raakhee told us how she liked the line said by Samantha/Skunk Girl in this comic, “I don’t want to, like, weaponize my scent”, as it was reflective of the conundrum of having a responsibility to fight evil/resolve conflict but not using brawn at the same time. Malavika felt that the necessity of using one’s superpowers depended on the situation, acknowledging that negotiation and diplomacy can only work to a certain extent. While she believed that feminism and violence should not go together, she thought that sometimes its more about telling the world that women can fight too. Harini pointed out the violence was perhaps not the best word to describe a hero’s fight, especially when they attack in retaliation or to contain damage. She remarked that as a superhero, some sort of violence is bound to be there but that doesn’t necessarily take away from their feminism. Vaishnavi recalled the conclusion of the movie Black Panther, wherein Killmonger and T’Challa’s differing visions for Wakanda are brought to the fore. Taking away from Killmonger’s belief that Wakanda’s technological prowess should be used to help the Black community around the world retaliate against discrimination and oppression, we were all left with the thought about whether superheroes actually help solve problems or make things worse. We ended the discussion agreeing that there is neither no clear-cut answer nor a right answer, and that different perspectives would lead us to different conclusions.